The global warming narrative never really flew as a scientific argument simply because the level of known temperature variation in the Holocene simply set the bar way too high. What warming actually occurred turned out to be a one off against a background of benign change. The clique in charge of the narrative was reduced to slandering opposition, a sure sign of fraudulent intent. Now we have Al Gores last kick at the can and it is more of the same as if nothing has changed at all. This is a sad case of a little bit of tentative science in the wrong hands. Lomborg: Gore’s prescriptions—for New York and the globe—won’t work. He claims the answer to warming lies in agreements to cut carbon that would cost trillions of dollars. That would not have stopped Sandy. What New York really needs is better infrastructure: sea walls, storm doors for the subway, porous pavement. These fixes could cost around $100 million a year, a bargain compared with the price of international climate treaties. Mr. Gore helped negotiate the first major global agreement on climate, the Kyoto Protocol. It did nothing to reduce emissions (and therefore to rein in temperatures), according to a March 2017 article in the Journal of Environmental Economics and Management...By 2030 the Paris climate accord will cost the world up to $2 trillion a year, mostly in lost economic growth, according to the best peer-reviewed energy-economic models. It will remain that expensive for the rest of the century. This would make it the most expensive treaty in history. They say the sequel is always worse than the original, but Al Gore’s first film set the bar pretty low. Eleven years ago, “An Inconvenient Truth” hyped global warming by relying more on scare tactics than science. This weekend Mr. Gore is back with “An Inconvenient Sequel: Truth to Power.” If the trailer is any indication, it promises to be more of the same. The former vice president has a poor record. 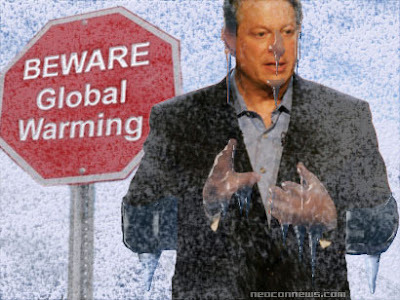 Over the past 11 years Mr. Gore has suggested that global warming had caused an increase in tornadoes, that Mount Kilimanjaro’s glacier would disappear by 2016, and that the Arctic summers could be ice-free as soon as 2014. These predictions and claims all proved wrong. This is misleading. The Intergovernmental Panel on Climate Change—in its Fifth Assessment Report, published in 2013—found “low confidence” of increased hurricane activity to date because of global warming. Storms are causing more damage, but primarily because more wealthy people choose to live on the coast, not because of rising temperatures. Even if tropical storms strengthen by 2100, their relative cost likely will decrease. In a 2012 article for the journal Nature Climate Change, researchers showed that hurricane damage now costs 0.04% of global gross domestic product. If climate change makes hurricanes stronger, absolute costs will double by 2100. But the world will also be much wealthier and less vulnerable, so the total damage is estimated at only 0.02% of global GDP. In the trailer, Mr. Gore addresses “the most criticized scene” of his previous documentary, which suggested that “the combination of sea-level rise and storm surge would flood the 9/11 Memorial site.” Then viewers are shown footage of Manhattan taking on water in 2012 after superstorm Sandy, apparently vindicating Mr. Gore’s claims. Never mind that what he actually predicted was flooding caused by melting ice in Greenland. More important is that Mr. Gore’s prescriptions—for New York and the globe—won’t work. He claims the answer to warming lies in agreements to cut carbon that would cost trillions of dollars. That would not have stopped Sandy. What New York really needs is better infrastructure: sea walls, storm doors for the subway, porous pavement. These fixes could cost around $100 million a year, a bargain compared with the price of international climate treaties. Mr. Gore helped negotiate the first major global agreement on climate, the Kyoto Protocol. It did nothing to reduce emissions (and therefore to rein in temperatures), according to a March 2017 article in the Journal of Environmental Economics and Management. Undaunted, Mr. Gore still endorses the same solution, and the new documentary depicts him roaming the halls of the Paris climate conference. By 2030 the Paris climate accord will cost the world up to $2 trillion a year, mostly in lost economic growth, according to the best peer-reviewed energy-economic models. It will remain that expensive for the rest of the century. This would make it the most expensive treaty in history. And for what? Just ahead of the Paris conference, the United Nations Framework Convention on Climate Change estimated that if every country fulfills every promised Paris carbon cut between 2016 and 2030, carbon dioxide emissions will drop by only 60 gigatons over that time frame. To keep the temperature rise below 2 degrees Celsius, the world must reduce such emissions nearly 6,000 gigatons over this century, according to the IPCC. A “successful” Paris agreement wouldn’t even come close to solving the problem. Mr. Gore argues that the Paris approach pushes nations and businesses toward green energy. Perhaps, but the global economy is far from ready to replace fossil fuels with solar and wind. The International Energy Agency, in its 2016 World Energy Outlook, found that 0.6% of the world’s energy is supplied by solar and wind. Even with the Paris accord fully implemented, that number would rise only to 3% in a quarter-century. In part because of activists like Mr. Gore, the world remains focused on subsidizing inefficient, unreliable technology, rather than investing in research to push down the price of green energy. Real progress in Paris could be found on the sidelines, where philanthropist Bill Gates and others, including political leaders, agreed to increase spending on research and development. This is an important start, but much more funding is needed. Mr. Gore declares in his new film that “it is right to save humanity.” No argument here. But is using scare tactics really the best way to go about it?